Do you crave for spicy, vegan curries, but don’t prepare them at home because you think they take too long or because it is difficult? 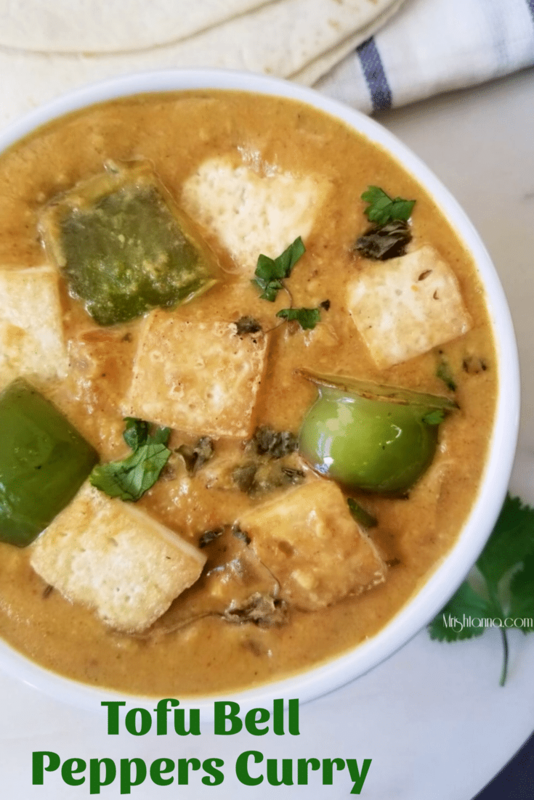 I can help you with both of those problems with this quick fix vegan curry that you will not only love but also discover that it is a lot healthier than the restaurant versions. I am not against eating out once in a while but when it becomes your only lifestyle, you are missing out on a healthier and cheaper option. I prefer my food to be homemade, healthy, flavorful and fast. That’s what saves my day when I am busy or tired and I just don’t feel like cooking much. 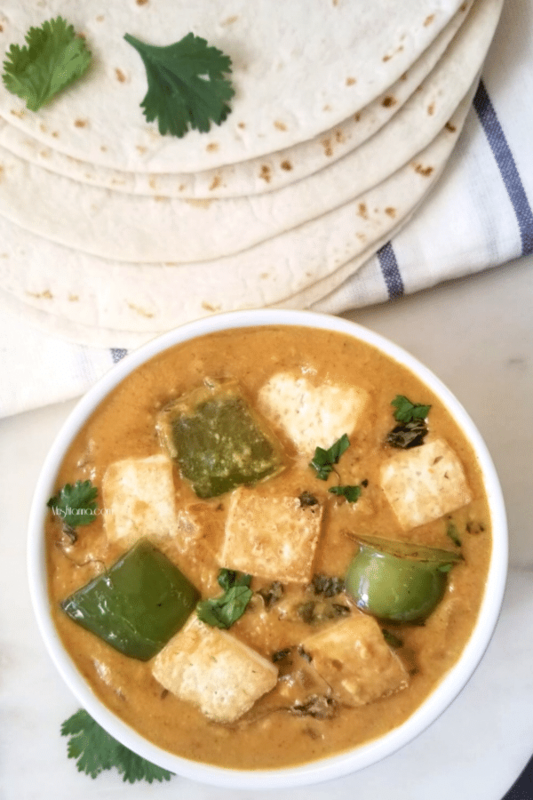 Now that summer is past us and we are heading into colder and shorter days, I figured this recipe for Tofu Capsicum Curry would hit the right note for a spicy recipe. If you do not prefer a spicy recipe, you can always tone down on the chilies. 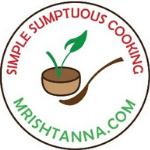 I have received a lot of requests for cooking tofu in Indian curries, without breaking them down in crumbles. This was a good chance to show you how you can accomplish that too. You start with frying the tofu pieces with light oil until they firm up and prepare base with onions, tomatoes, and Capsicum (Bell Peppers). I used cashew paste as the binder in preparing the base. 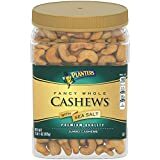 Cashew paste brings in a creamy flavor that you do not find in any other vegan alternatives. 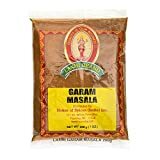 What makes this recipe unique among other Indian curry recipes is that I also used Kasuri methi, which adds nice subtle taste and flavor to the gravy. Check out my step by step photo guide for more details. One little tip before you prepare this is that you do not want to fry the tofu too much where it hardens and gets a deep-fried texture. Frying them too much will seal all the sides and not allow any of the curry flavors to soak up the tofu. Once you prepare the recipe you will agree with me that this is one of the best and easy masala curry recipes. That’s one cheaper, faster AND healthier alternative to restaurant food! 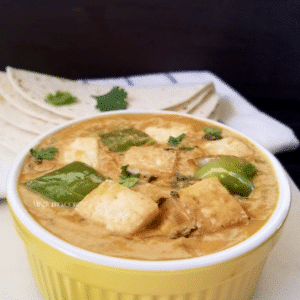 Tofu Capsicum Curry can be enjoyed with Warm Naan, or Pita bread or even steamed rice. Tofu and bell pepper is a delicious combination with cashew base, which can make mouthwatering Indian curry. Place a pan on medium heat and fry tofu cubes until they are golden brown. Place them aside. In the same pan, fry bell pepper in 1 tbsp oil, for 3-5 minutes until they are softened. Remove them from the pan and set aside. In the same pan, fry the cumin seeds and as they start to sizzle, add onions and continue to fry until the onions appear translucent. Now add ginger and saute for about 30 seconds. Add tomatoes and continue to saute until they soften. Add the following spices and continue to cook until they start to separate from the oil: Turmeric, Coriander, Garam Masala, and chili powder. Now, add 1 cup water and cashew paste (Soaked and softened cashews blended with just a little water). When it starts to boil, add the tofu and bell peppers and continue to cook. Add a little water if the gravy appears too thick. Add salt to taste. Cook for another 2 minutes and your curry is ready! Garnish with fenugreek leaves and cilantro! 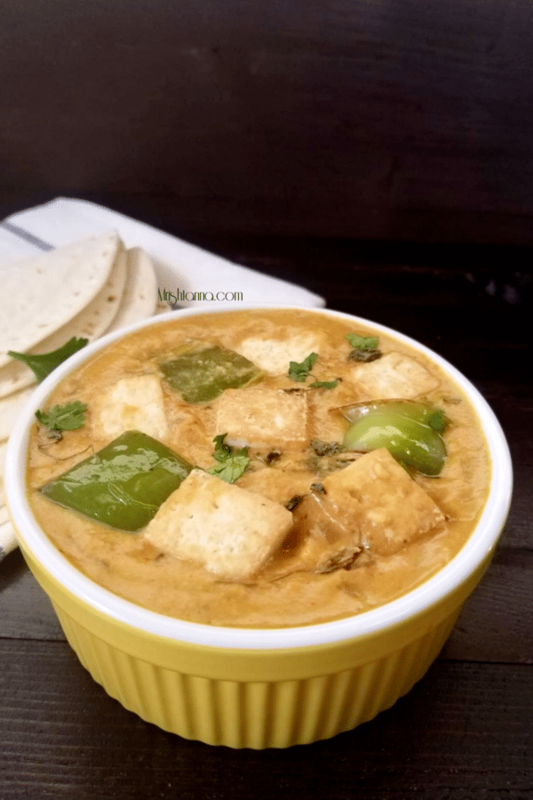 Tofu Capsicum Curry is best matched with Hot Naan or Pita bread. Steamed rice is also a good option. Place a pan on medium heat and fry tofu cubes until they are golden brown. Place them aside. In the same pan, fry bell pepper in 1 tbsp oil, for 3-5 minutes until they are softened. Remove them from the pan and set aside. In the same pan, fry the cumin seeds and as they start to sizzle, add onions and continue to fry until the onions appear translucent. Now add ginger and saute for about 30 seconds.Â Add tomatoes and continue to saute until they soften. 3. Add the following spices and continue to cook until they start to separate from the oil: Turmeric, Coriander, Garam Masala, and chili powder. 4. Now, add 1 cup water and cashew paste (Soaked and softened cashews blended with just a little water). When it starts to boil, add the tofu and bell peppers and continue to cook. Add a little water if the gravy appears too thick. Add salt to taste.Cook for another 2 minutes and your curry is ready!